A mechanics’ lien claim is a statutory remedy for contractors, subcontractors and material suppliers who have not been paid for construction work or building materials they have provided in connection with the construction of a building or other improvement to real property. A mechanics’ lien claim, if successful, results in the establishment of a lien against the real property (the land and buildings thereon) where the work or materials were provided. The lien can be used by a Maryland construction lawyer to force a sale of the real property as a source of monetary funds to satisfy the amount due for the construction work or building materials provided. The original rational in this country for creating this statutory remedy was to encourage contractors, subcontractors and material suppliers to provide work and materials in connection with the construction of Washington D.C. The federal government’s credit was not as good back then as it is today. In Maryland, a subcontractor (any contractor or material supplier who does not have a contractual relationship directly with the owner) must serve a “Notice of Intention to Claim a Lien” on the owner of the property within 120 days from the last day they performed work or supplied materials on the project. Sometimes performing follow up warranty repair work or punch list items, even if performed long after the main work is completed, can constitute the last day. However, don’t take chances. Contact an attorney at Cowie & Mott, P.A. early for a free consultation. The “Notice of Intention to Claim a Lien” and the “Petition for Mechanic’s Lien,” referenced above, must contain specific informayion and documentation as speciied in the Mechanics’ Lien Statute. Failure to timely include all the require information and documentation can result in the failure to obtain a lien. Under Maryland law, mechanics’ liens can be placed on private property relative to construction work or renovations that increase the value of the property by 15%: “every building erected and every building repaired, rebuilt, or improved to the extent of 15 percent of its value” is subject to the establishment of a mechanics’ lien to satisfy payment of all debts. In new construction this threshold is always satisfied . It doesn’t matter how small your portion of the work or materials may be, it’s the value of the entire improvement that counts. A mechanics’ lien proceeding is “in rem” (i.e., that means the claim is against the property and not any specific person). Only the real property where the work was performed is subject to the lien. This is to be distinguished from an “in personam” proceeding (i.e., an action against the person) where a judgment against a defendant subjects all of the defendant’s property (e.g., bank accounts, personal property, etc.) to satisfaction of the judgment. An example of an in personam proceeding would be an action for breach of contract against the owner of the property for failure to pay for work performed. A contractor or subcontractor, who brings a mechanics’ lien claim against the property, may also have a Maryland construction law attorney maintain a simultaneous in personam claim against the property owner and others who might be liable, if such an action is available. Because a mechanics’ lien claim is against the property where the work was performed and not against the property owner personally, the property of the owner may be subjected to the lien of an unpaid subcontractor, even though the owner has no agreement to pay the subcontractor and may not even have known that the subcontractor performed any work on his or her property until receiving notice of the subcontractor’s intention to file a mechanics’ lien claim. For example, if an owner enters into an agreement with a contractor to construct a building on the owner’s property, the contractor may, in turn, enter into a subcontract agreement with a roofing subcontractor to install a roof on the building. If the general contractor fails to fully pay the roofing subcontractor for its work of installing the roof, the roofing subcontractor’s remedy is not merely limited to suing the contractor for breach of contract. Instead, the roofing subcontractor may also seek to establish a mechanics’ lien against the owner’s property in the amount of the unpaid balance due for the roofing work. The mechanics’ lien statute imposes certain requirements on such claims that are designed to give the owner notice of unpaid subcontractor claims shortly after they arise. However, with the exception of single-family homes, the burden falls on the owner to make sure all subcontractors have been paid before making final payment to the contractor. 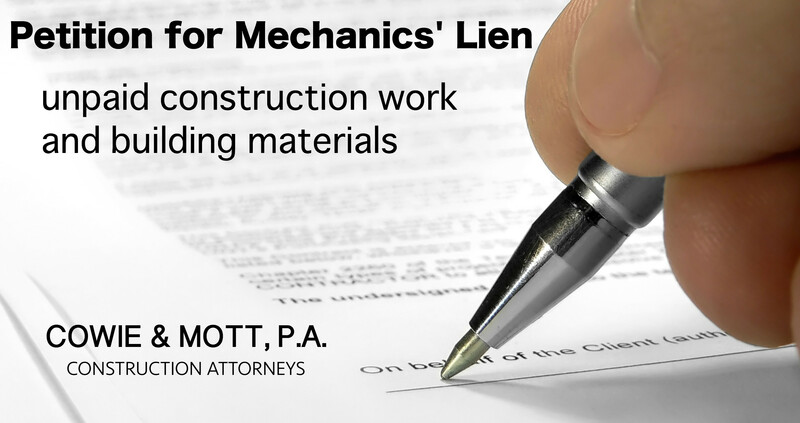 An owner can require a contractor to obtain signed mechanics’ lien releases from all subcontractors and material suppliers on a project for work performed and materials. These releases will protect owners and contractors from mechanics’ liens.